PTViewer is an open and free Panorama viewer. It is written in the Java language (v.1.0.4) and should run in any java-enabled browser. From Version 1.4, there is an additional Java-application which runs without any browser on Java 1.1 installations. 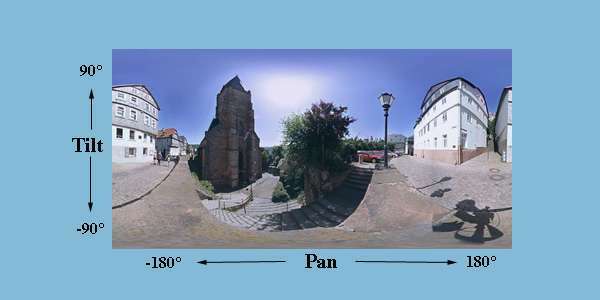 Spherical and Cylindrical Panorama Playback: Horizontal field of view: 360°, Vertical field of view 0-180°. Playback of Quicktime VR panoramas (Cylinders and Cubes) and Object movies using PTMViewer extension. Display of rectilinear Images using optional PTZoom extension. High Quality bilinear rendering as found in better plug-in viewers, and unlike many other java viewers. Image and window size only limited by system memory. Tiny file size (<25kByte) for fast download. Package all files into one self-displaying tour using the Jar-utility. The "Pan", "Tilt" and "FOV" values which you can set to override the defaults, are easily deduced from the figure above. JPEG and GIF images are supported. Any size for the source panorama can be used, however, memory requirements for image decompression may be quite large for some java engines. Suitable images can be created using various commercial packages (LivePicture, iMove) or the free PanoTools software from this site. Open the cylindrical image in Photoshop (or any other Graphics program with the Panorama Tools plug-in installed). The example below is such a cylindrical rendering of the scene above as might have been used for QTVR. 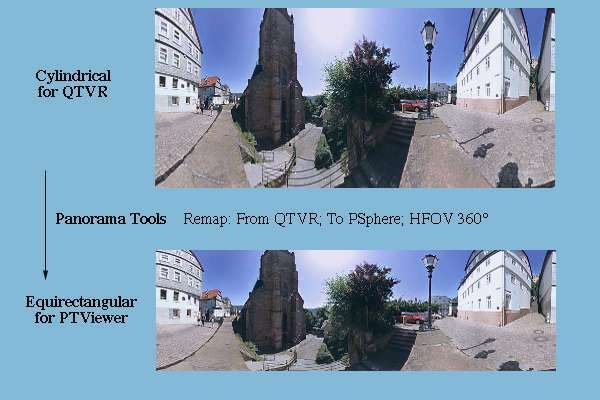 It is converted to PSPhere/equirectangular format using the remap tool with the shown settings. Notice that the image gets smaller without loosing information. The saving are quite considerable in large vertical field of view images. Partial panoramaswith pan-range smaller than 360° and Flat Images can also be displayed. See the separate documentation for details. Image format may be JPEG (recommended for photographs) or GIF. To protect images against theft PTViewer images may be encrypted using the PTCrypt utility. There are various encryption options available, consult the PTCrypt documentation for details. Encrypted images are recognized by their extension (jpa, jpb, jpc,..) and can not be read by standard graphics programs. Using the stronger encryption features, they can't even be read by PTViewer if they are moved or copied from their original location. The java code is contained in the file ptviewer.jar, which has to be placed in the same directory as the html-file, or you may provide a different path in the archive tag. Some viewers can not read jar files, and you have to provide the uncompressed class file instead. PTViewer may be used with these minimum controls. The file SimplePano.html in the distribution demonstrates this minimum functionality which is sufficient to view and navigate the panoramic images. file - The filename of the panoramic image. Alternatively, a panorama from a list specified using the pano0/1/2 tag can be loaded using the filename 'ptviewer:Number' . Example: 'ptviewer:3' loads the panorama with list number 3.
pwidth, pheight - Width and height of Panoramic image in pixel. By default, these parameter equal the width and height of the image specified in 'file'. Required only if regions of interest (ROI) are inserted later. See chapter below. waittime - Minimum time to display the wait image, in Milliseconds (default 0). This is useful if an animated gif-image is used, and the animation should finish before display of the panorama. auto - autorotation angle (-360...360, default 0) pan angle is incremented by that amount for each frame. Specify degrees, fractional values allowed. maxarray - the maximum size for linear arrays on this machine (default 524288 for Netscape). See the notes about large images. frame - An image to be displayed in front of the panorama window. This should be a gif or jpeg image. It will be inserted into the applet window aligned to the lower right edge. See the control buttons in Controls.html for an example. bar_width - the width of the progress bar (default width/2). bar_height - the height of the progress bar (default 10 pixels). barcolor - the color of the progress bar (default dark gray). view_width - the width of the panorama viewer in pixels. Defaults to width of applet window. view_height - the height of the panorama viewer in pixels. Defaults o height of applet window. view_x - x-coordinate of upper left corner of the panorama viewer. (default 0). view_y - y-coordinate of upper left corner of the panorama viewer. (default 0). pano0,1,2,3 -List of panorama images for built-in controls. See next chapters for details. hsimage - Name of hotspotimage describing masks for all hotspots. This image must have identical dimensions as the panoramic image. See chapter on hotspots below. sound0, sound1, sound2,... - Names of sound files to be used by the applet. quality - determines which of the two built-in pixel-interpolators are used for rendering the images: either the nearest-neighbor (nn, fast, low image quality) or the bilinear (bi, slow, high image quality) interpolator. The available options are 0 - always nn; 1 - nn for panning and autopanning, bi for stills; 2 - nn for panning, bi for stills and autopanning; 3 - always bi. (default 3). applet0, applet1,... - Applets to be loaded into ptviewer. Use this feature to load Panorama Movies, Objects or other helper applets. preload - Comma separated list of image files to be downloaded in the background. This is useful for VR-tours with many panoramic images. These are instantly available, without any download delay. cache - Set to 'false' if you want to disable PTViewer's internal RAM image cache (default: true). This may be required for very large tours which don't fit into RAM. cursor - Set to CROSSHAIR or MOVE to change the default arrow cursor. This change takes place only when the cursor is inside the applet window. loadAllRoi - set to "false" to disable download of all ROI-images at initialization time (default: true). grid_bgcolor - Hexadecimal integer specifying color of grid background (default white). This grid is displayed if tiled download is used, see chapter about ROI-images. grid_fgcolor - Hexadecimal integer specifying color of grid foreground (default black). This grid is displayed if tiled download is used, see chapter about ROI-images. mass - Inertia can be added to the viewer using a virtual mass (floating point parameter). This parameter influences the response of the viewer to directional changes. By default, this parameter is set to 0 turning off any delayed response. The useful and visible range of parameters for this option is ~10-30. antialias - Set this option to 'true' to turn on the Antialiasing feature. A series of scaled source images is created. Antialiasing is supported for equirectangular panoramas, QTVR panoramas (cylinders, cubes) and PTZoom images. For details see this example. oversampling - This floating point parameter is used with the antialias option above. It determines the maximum ratio of source resolution (pixel/degree) to screen resolution (pixel/degree). The default value is 1.5. Larger values cause more aliasing, while smaller values soften the view. Please note that no quotes are used to enclose the parameters to the right side of the equations. Also, no spaces should be used on the left sides, since the simple parser used to read these parameters might get confused. Download feedback for the panoramic image is provided in two different formats depending on whether a 'wait'-image has been set. If not, then download feedback is provided by a message "Loading Image....X% complete" with X being the proper percentage. If a waitimage is specified, a progress bar is plotted inside the image. Size, location and color of this bar can be specified using the 'bar_..' tags. Download feedback indicates 80% when the image file has been loaded, and 100% after the image has been decompressed. Default (no specifications). A square region 24x24 pixels (in the viewer!) surrounding the x/y coordinate of the hotspot. Rectangular (specify a/b). A rectangular region (in the panoramic image!) limited by point x/y to the left and a/b to the right . Arbitrary shape (specify mask image m for each hotspot) The white regions of the mask image (in the panoramic image). Arbitrary shape (specify grayscale hotspot image hsimage, one for all hotspots, same size as panorama). The gray value of a pixel (0-254) determines the hotspot number it belongs to. 255 (white) means 'no hotspot'. This last method can not be mixed with the other three cases. xnumber or Xnumber- the x - coordinate of the hotspotlocation. 0 is left. x - absolute pixelcoordinate (0...width), X - relative pixelcoordinate (0...100), fractional values allowed. ynumber or Ynumber- the y - coordinate of the hotspotlocation. 0 is top. y - absolute pixelcoordinate (0...height), Y - relative pixelcoordinate (0...100), fractional values allowed. n'name' - the name of the hotspot displayed in the status line if the mouse moves over it. Must be enclosed with single quotes ('). u'name' - the URL of the linked document relative to the html-document. Must be enclosed with single quotes ('). Instead of an URL, any of the ptviewer commands can be specified using the prefix "ptviewer:". chexnumber - the RGB-color of the default hotspot marker. Specify as hexadecimal number RRGGBB. Default is red. This hotspot plays the sound numbered 0 when the mouse enters. Hotspots executing commands are always of type popup and don't react to the showHS() command. If the 'e' parameter is specified, then 'i' specifies a text window, see below. t'name' - name of target in html-document specified with option u.
m'name' - name of an image to be used as mask for shaping hotspots. Normal hotspots have square format and are 20x20 pixels large. To set other shapes, create a gif-image which is white at locations belonging to the hotspot. This image will be referenced with the upper left point being the x/y coordinate specified above. Hotspot markers appear centered in the image. Please see the streetlight example in the distribution. p - Specifying p (without parameter) makes this hotspots image pop up when the mouse moves over it, see the streetlight example. q - Specifying q (without parameter) makes this hotspot always visible. This may be used as floating logo. w - Specifying w ( for 'warped', without parameter) causes the specified image (see i-tag) to be inserted into the panorama image rather than into the viewer window. As a result, the image is blended and fixed to the background. See the roof of the building to the left in the example "Controls.html" which turns green when showing the hotspots. This feature works for permanent, popup and normal hotspots. The image will be inserted centered at the x/y coordinate. Please note that x/y = 0/0 refers to top left, while some graphics programs use the convention (1/1) for this point. The image must fit into the panoramic image and may not extend across the back seam. Hotspots using warped images are by default rectangular, ie the area of the image is active region of the hotspot, unless a separate mask image is specified. a number or A number - the x-coordinate of the right edge of a rectangular hotspot. a - absolute pixelcoordinate (0...width), A - relative pixelcoordinate (0...100), fractional values allowed. If a or A is set, the active hotspot region is a rectangle with left coordinate x and right coordinate a. The hotspot marker image is shown centered. Please note, that a rectangle in the panoramic image is warped in the viewer window. If you need exact shapes, then use the m-tag for a masked hotspot. b number or B number - the y-coordinate of the right edge of a rectangular hotspot. b - absolute pixelcoordinate (0...height), B - relative pixelcoordinate (0...100), fractional values allowed. If b or B is set, the active hotspot region is a rectangle with left coordinate x and right coordinate a. One of b or y should be the top, the other coordinate is the bottom of the rectangle. The hotspot marker image is shown centered. Please note, that a rectangle in the panoramic image is warped in the viewer window. If you need exact shapes, then use the m-tag for a masked hotspot. Options may be specified in any order. A common use for hotspot images is the tripod cap, ie a small logo at nadir position which covers the inevitable tripod head in full spherical panos. This logo usually links to the author of a panorama. See these examples which use normal, and warped hotspot images for this purpose. xnumber - the left x - coordinate of the static hotspotlocation. ynumber -the top or bottom y - coordinate of the static hotspotlocation. anumber - the right x - coordinate of the static hotspotlocation. bnumber -the bottom or top y - coordinate of the static hotspotlocation. i'name' - name of image to be displayed when hotspot is activated. Must be gif or jpeg, and will be shown aligned so that top left coincides with x/y. Please note that the image is never displayed unless either of the p or q parameter is specified, or the DrawSHSImage() scripting command is executed. Instead of an image, any of the ptviewer commands can be specified. This command will be executed when the mouse enters the hotspot region. Hotspots of the command type are automatically of type popup. p- Specifying p (without parameter) makes this shotspots image pop up when the mouse moves over it. q- Specifying q (without parameter) makes this shotspots always visible. Static Hotspots may be stacked like normal hotspots. If one hotspot has identical x,y, a and b coordinates as another hotspot prior in the list, it is assumed to be identical. If this hotspot gets activated by clicking the mouse, or moving the mouse over it, the appropriate actions of both hotspots are executed. Arbitrary many hotspots may be stacked at any position. i'name' - name of image to be inserted (required). y'number' - vertical pixel coordinate of insertion point (upper left point of image). Default: 0. The image 'myimage.jpg' is inserted at coordinates 50/80 into the panoramic image. The image must fit into the panorama without extending to the right or bottom. Preparing the scaled image "SmallPano.jpg" may be tricky: Most Graphicsprograms slightly shift images upon scaling by some fractions of a pixel size vertically and horizontally. This shows up during progressive download as annoying movement of parts of the image. Therefore, the scaling-algorithm has to be the exact inverse of that used by PTViewer, which scales relative to the center of the image. This is also the scaling algorithm used in the 'Correct'-tool of the Panorama Tools plug-in software, which is recommended for this task. If no "file" parameter is set, but nevertheless the panorama width ("pwidth"), then ptviewer displays a grid, with horizontal and vertical lines spaced by 10°. This grid can then be filled progressively by ROI images to create a progressive download. The background and foreground colors of this grid can be set using the parameters "grid_bgcolor" and "grid_fgcolor". They default to white and black. Large zoom ratios (>3:1) are better implemented using the PTZoom extension. Many more media formats are available if JMF is installed on the host computer. These include avi-video, linear quicktime video, flash 2, mpeg1/2/3, many soundformats etc. From version 1.7.2 of PTViewer, JMF media are loaded via the optional PTMedia extension. startAutoPan( pan_inc, tilt_inc, zoom ) initiate autopanning. Each successive view's panangle is incremented by pan_inc, its tiltangle is incremented by tilt_inc, and its field of view is multiplied by zoom. newPanoFromList( num ); Load Panorama numbered num into the applet. This panorama must have been previously defined using the panonum tag. newPanoFromList( num , panangle, tiltangle, field-of-view) Same as above, but set new view parameters. newPano( String ); Load new Panorama as specified in String. The syntax for String is identical to that of the panorama list. PlaySound( num ); Play back sound No num. DrawSHSImage( num ); Draw static hotspot image. HideSHSImage( num ); Hide static hotspot image. ToggleSHSImage( num ); Toggle visibility of static hotspot image. HideHSImage( num ); Hide hotspot image. ToggleHSImage( num ); Toggle visibility of hotspot image. waitWhilePanning(); waits until autopanning, moveTo() or moveFromTo() has finished. loadROI( num); load and insert ROI image numfrom list of ROI images. loadROI( num1, num2); load and insert ROI images from num1 to num2 from list of ROI images. setQuality( num); sets the quality parameter to 0,1,2, or 3. Some functions require arguments, eg. startAutoPan(). These arguments should be supplied as constants. Allowed is startAutoPan(2,3,1.2), not allowed is startAutoPan(1+0.5, tilt, zoom*1.05). getAutoPan() returns true if autopanning, else false. For a more descriptive list of all publicly accessible parameters and functions in ptviewer, see the API-documentation generated using javadoc. New Panoramas can be loaded using the newPano() and newPanoFromList() functions. The newPanoFromList() function requires the previous definition of a list of panoramas, whereas the newPano() function supplies all definitions in a string argument. Linking to hotspots using the u-tag in the hotspot description, see examples above. All files belonging to a VR-scene (images, sounds, textfiles) can be packaged into one single archive using the Jar archiving tools. This is a convenient way to store, mail and present virtual tours. Only the html-file has to be kept separate. Double-clicking this html-file launches the browser, which then automatically extracts and displays the content of the file. See the separate documentation about packaging tours for details. Pressing 'v' displays the current pan, tilt and field-of-view angles. This is useful for setting initial views, or specifying parameters for the gotoView() command. Pressing 'h' and clicking the mouse displays the current X/Y coordinates in the panoramic image. These are useful for specifying hotspot parameters. The values are relative coordinates (0...100) and have to be used with capitol X and Y in the html-document. Pressing 'i' displays a copyright message and version number in the status bar. Pressing 'u' displays the URL to the HTML document. Pressing 'p' displays the path to the HTML document. This application uses the Java-applet 'PTViewer' and a custom AppletStub to implement a standalone cross platform spherical panorama viewer. Using the internal scripting capability of PTViewer, full featured VR-tours can be displayed. The same html-file used for display in a browser can be reused for the application.Using the Java archiving tool 'Jar', it is possible to pack tours into one self-displaying file. See the separate documentation describing this feature. In contrast to applets, applications can't handle sounds, at least on pre-java 1.2 installations. The application allows the user to resize the viewer window. If the viewer-size has not been set (parameter view_width and view_height), the applet will also be resized according to the window. If the viewer-size has been set (most likely to fit the applet into a frame) then the applet does not react to window size changes. Do not resize the window while the applet loads the image. PTViewer does not display a file dialog if a html-file with name 'default.html' is present in the applications directory. PTViewer then loads and processes this file. This can be used for self-displaying tours. PTViewer may also be called by other java applications. The main() method of the ptvjapp class should be called with the filename of an image or html-file as argument. The defaults file may also be packaged into the PTViewer.jar file together with any auxiliary images like hotspot buttons, frames or wait images thus providing a convenient way to customize the viewer. Using the API-documentation, it is possible to extend PTViewers capabilities using additional applets. Five such applets are included in the distribution: PTObject, PTMovies, PTCompass, PTMedia and PTZoom. See this documentation about the use of these applets, and how to build your own extensions. Extensions for sound, movies, objects, more. Partial Panorama 1 and 2, Flat Images. Linking multiple PTViewers using JavasScript. PTViewer is distributed under GNU license, see the file 'Copying' in the distribution.